The Matki ranges of shower doors, surrounds, shower mixers, bath screens and shower trays combine leading-edge design with effortless elegance – the hallmarks of true Matki quality. So, whichever collection you select from, you’ll experience the timeless elegance, effortless style and efficient operation that is so unmistakably Matki. 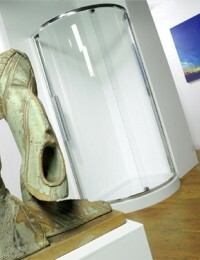 Image showers are leaders in the manufacturing of shower enclosures for today’s styles. The simple elegance of their enclosures reflects the needs of the modern lifestyle. A range of styles and sizes to suit most bathrooms and most of Image’s enclosures are suitable for use with today’s power showers. A wet room has to be absolutely watertight, so usually the room is dry-lined with something called Wedi board - a reinforced, rigid polystyrene board which is completely waterproof when fitted correctly. Newport Bathroom Centre have fully trained installers for both the German 'Wedi' system and for NewportDec Wetroom Systems.